Did you ever wonder what it would be like to give up all the stress and pressure of your big city life and move to a farm in the country? Well for Josh Kilmer-Purcell and Brent Ridge, aka The Fabulous Beekman Boys, it’s actually just as stressful – but 100 times more fulfilling. Brent is a doctor who used to work for the domestic goddess Martha Stewart and Josh is a marketing exec and former drag queen named Aqua. But in 2008, the couple bought the Beekman Mansion in Sharon Springs, New York, and started a new life raising goats, growing organic food, and practicing the ways of seasonal living. They also launched a product line called Beekman 1802 selling soap, cheese, linens, stationary, and more — straight from the farm, using local ingredients, materials, and the talent of nearby artisans. As idealic as it may sound, their new lifestyle is a lot of hard work. 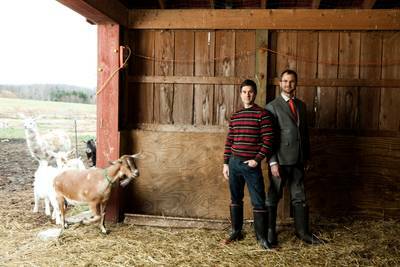 But the Beekman Boys aren’t just following their own dreams, they’re helping their neighbors realize theirs as well. But this isn’t just a bland show with a message, the lovable charm of The Fabulous Beekman Boys is the most entertaining new show on TV. Check it out on Wednesday nights at 9:00 PM on Planet Green.